This time there was no warning. There was no hurricane, no tropical storm warning -- just a flash flood warning, which is common in Houston and usually doesn't mean homes will flood. In my hometown of Houston, and specifically in my area of town, millions of dollars had been spent on an infrastructure of retention basins for the Braes Bayou near our Houston home. In the past, most memorably during Tropical Storm Allison, the homes to the south side of Braes Bayou were prone to flooding. Many people rebuilt their homes to a higher elevation. 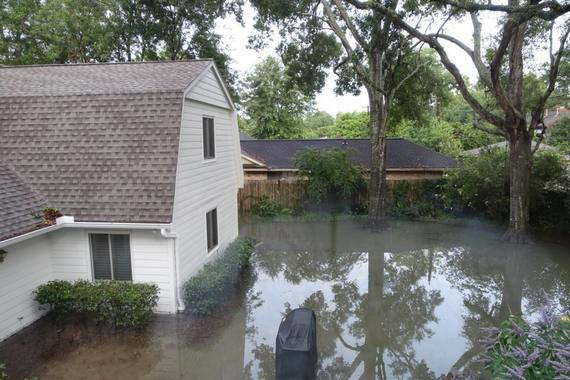 Being on the north side of that bayou, our neighborhood had less problems with flooding from the bayou. 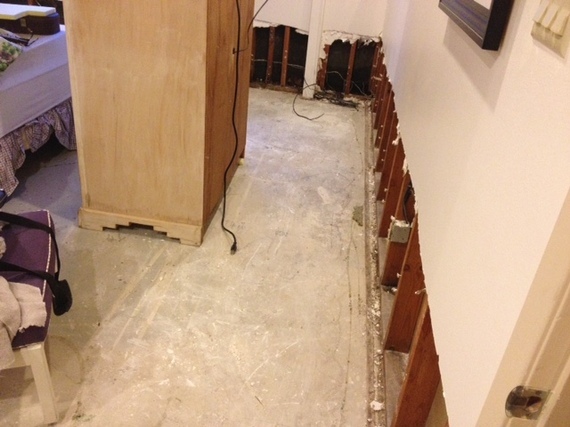 After Allison flooded much of Houston, we made improvements to our own home with drainage just to be on the safe side. We have had the rainiest year I can remember in my 34 years in this city, but the bayou never seemed to rise to dangerous levels. I believed the situation was under control. This past Monday evening, after my husband checked our drains and gutters during a torrential rain storm (not uncommon in sub-tropical Houston) and backwashed the pool a foot in case of inches more of rain, he went to bed. I was out of town, stuck due to the storm. My husband next put his foot down at 4:00 a.m. to use the bathroom and was up to his ankle in water. The brown, murky bayou had come into our home. In the next room, my elderly dad did the same, got up to use the restroom, and discovered the water. I got a middle of the night text and called as soon as I got it. Bad news. Horrible news. Yet, I had no idea what awaited at home. What awaited was filthy water standing in a pool in my sunken living room, though the rest of this very ugly water throughout our house had receded back outdoors. The carpets were squishy wet throughout, and the ugly watermark lines were on our furniture and walls. Almost two feet of water had entered our home and spread through the house and most of it quietly left leaving mildew, mold, and bacteria behind. Just about all of our wonderful neighbors and friends suffered the same fate. Our lovely neighborhood was devastated in what they called the "Ground Zero of a 500 Year Flood Event." Below is a photo of the home directly across the street. Photo credit to Linda and Andy Burger. People who have not lived with this kind of event are clueless as to what to say. I so appreciated the outpouring of love, of sentiment, of sorrow for us, of empathy. Of course I did. When offered, "What can I do?" I was obviously too overwhelmed to even think of something to request. A few savvy people just took matters into their own hands and came up with things to help. Oh, and the chocolate always helps. My brain was functioning on one-quarter capacity. I hear that auto accidents are common when trauma survivors have a partially functional brain. Overwhelmed and overloaded, my brain just started shutting down. It's hard to process the enormity of this kind of damage. "It is just stuff. Stuff can be replaced." I could not agree more that all stuff, except for sentimental albums and photos and other heirlooms can be replaced, but people who have not experienced this kind of event do not understand the utter mess left behind. 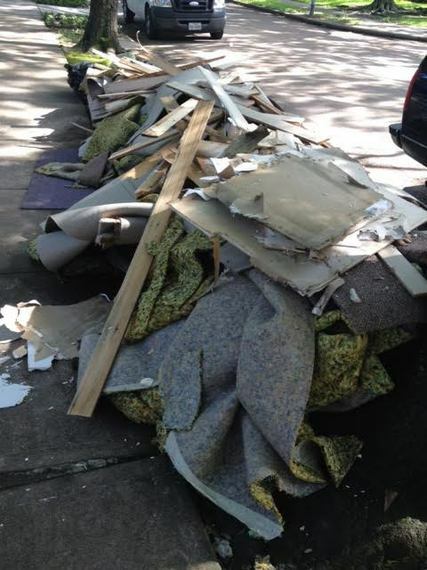 The invasion of restoration teams that clean you out after a flood break up and tear up your home inch by inch, bit by bit, until it is stripped bare and your "stuff" that can be salvaged is in heaping piles. 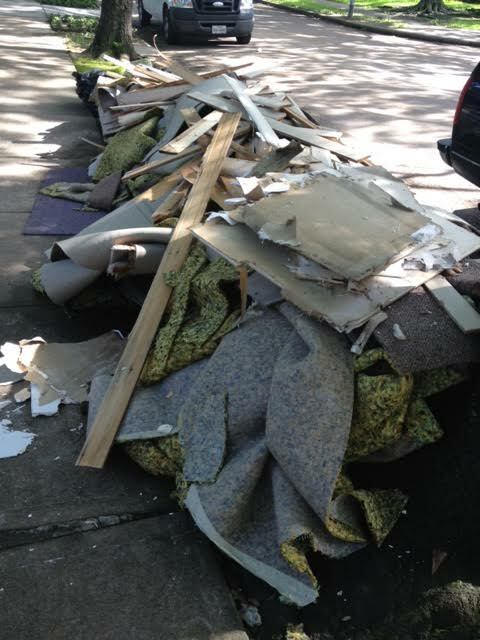 It is just devastating to see your house, the one that you made into a "home," become a pile of rubble. Also -- being displaced; it is again not the stuff that makes this so awfully painful, it is the displacement from your home and the unknown of when it will be your home again. Where will we live? What do we do with my 88 year old father who lives with us? The other remark I did not enjoy at was, "At least you are all safe." As if two feet of water can be life threatening to adults! I guess the news reports nationally showed people being swept away in flood waters and I am not minimizing the grief to those who lost someone in that situation -- but that was NOT our situation. There was no current of water ready to sweep us away, and instead it just seeped in and left as quietly as it arrived without danger to anyone. While I appreciate that this was not life threatening, the event is so life interrupting, so emotionally devastating that no one really understands or cares about that in making that statement about us being safe. We are physically safe but in emotional danger. We feel unsafe in a strange land, and forced out of our homes, sleepless and disoriented, and stressed out to the max. Will we ever feel safe again, knowing this might happen again after we rebuild our lives? Many others just offered an "I'm so sorry you are going through this ordeal." Perfect. Comforting. Perfection. Thanks to the majority offering those kind words and to those offering assistance. It is appreciated more than anyone could ever know. We have a very long road ahead of us. There is grief for the way of life and the comfort in our home as we knew it is now gone. We will be handling a nightmare of red tape next: dealing with adjusters, listing all of our contents, cleanup and sorting, and all kinds of packing up added to our busy work schedules. It may be six months to a year until things return to normal. And yet, that's all I long for when I get sad about what happened to me and thousands of others in Houston. NORMAL. That's what I long for and it seems so far off. It makes me wonder: when will our lives ever be normal again?